Last night in Los Angeles, unbeaten three-weight king and current WBO welterweight champion Terence Crawford picked up the prestigious ESPY award for Fighter of The Year. The 30 year old put the news up on his official Instagram account: “Hard work pays off!” he wrote. In being awarded the trophy, Crawford bested fellow pound-for-pound entrant Vasyl Lomachenko as well as a number of MMA fighters. Since the last ESPY awards took place in July of last year Crawford has reeled off two highly impressive wins in two weight classes. 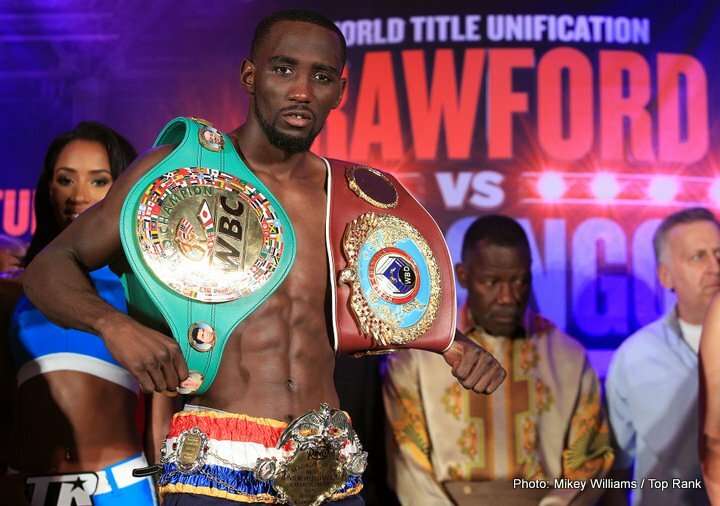 Back in August of 2017 Crawford unified all four 140 pound world titles with a crushing stoppage of Julius Indongo. Then, just over a month ago, Crawford made his move up to 147 and he beat up and stopped Manny Pacquiao conqueror Jeff Horn to take the WBO belt. This title will be the first of more to come at welterweight, Crawford and his fans and supporters fully believe. Some fans may have felt Lomachenko – who has picked up three also hugely impressive wins since last July: beating Miguel Marriaga and Guillermo Rigondeaux, both at 130 pound and both by corner retirement stoppage, and then moving up to take lightweight honours with a brilliant stoppage win over Jorge Linares – should have won the ESPY award. It must have been a tough decision indeed for all concerned. Even bigger things are expected of the 33-0(24) Crawford – including, one day, hopefully not too far off, a massive welterweight unification showdown with the superb Errol Spence. If he can achieve victory in that fight – a match-up that has already been referred to by some as a modern day Leonard-Hearns – Crawford’s trophy cabinet will become even more swelled than it is already. For the time being we await Crawford’s next fight, pencilled in for October. There is no confirmed opponent yet, but unbeaten duo Jose Benavidez and Egiidijus Kavaliauskas are both very much in the frame to land the next shot at this seemingly complete fighter. Spence aside, can anyone beat Crawford? What a shame Crawford and Lomachenko are not operating at the same weight.